IBNET (International Benchmarking Network for Water and Sanitation Utilities) (www.IB-Net.org) is the world’s largest database for water and sanitation utilities performance data. Supported by the World Bank’s Water and Sanitation Program, it has over the years accumulated a wealth of data from utilities in the Danube region, which have been used in Chapter V. Building on this invaluable resource, the Danube Water Program has launched DANUBIS.org, an online repository of resources for and about water and sanitation utilities in the Danube region. DANUBIS.org works in partnership with national stakeholders in most countries of the region and aims at consolidating information available from national sources, the IBNET, and this report. 59. Most countries in the region have some mechanism to monitor the performance of utilities in the sector, but it is seldom made publicly available. Table 7 presents an overview of institutionalized utility performance information systems and other benchmarking schemes in all countries of the region. In all countries with an established regulatory agency, the institution has taken the lead in developing at least a limited utility information system. Practices with regard to whether the information is processed into a formal regulatory ranking or performance revaluation, and whether it is made publicly available, vary, however. 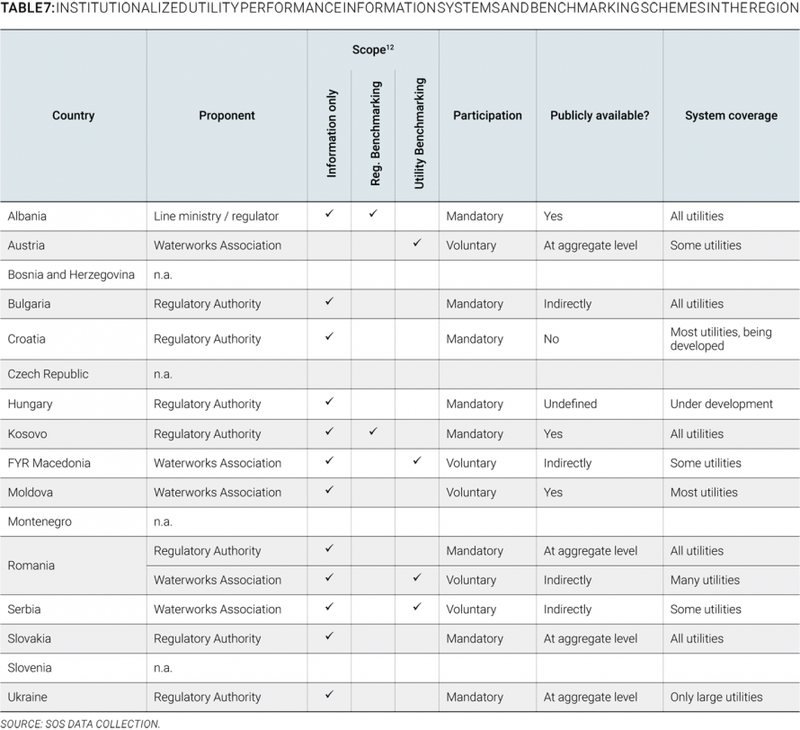 Only two countries, Albania and Kosovo, regularly publish an annual regulatory benchmarking report. In countries where no such institution exists, waterworks associations have often developed voluntary utility benchmarking schemes to help their members improve their performance, and in some cases to allow for more effective lobbying for greater support to the sector.